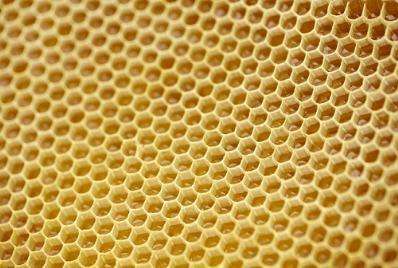 The mystery of the hexagonal shape of honeycomb cells has been revealed by simple mechanics. The honeybee comb is a widely studied natural cellular structure. The rounded hexagonal shape of its cells has intrigued natural scientists and philosophers for millennia. They have suggested many explanations some of which would need the bees to have an uncanny ability ("forethought" according to Pappus of Alexandria in 4 AD) to perform mathematical calculations or the magical quality to measure lengths and angles. Now research from Cardiff University's School of Engineering, published in Journal of the Royal Society Interface, has found that the cells in a natural honeybee comb have a circular shape at "birth" but quickly transform into the familiar rounded hexagonal shape while the comb is being built. from Beijing Institute of Technology and Peking University also shows how this transformation takes place. "People have always speculated how bees have formed these honeycombs," said Professor Karihaloo "There have been some incredible, esoteric, even bizarre explanations; they believed the bees had an uncanny ability to measure angles. But it's actually much more straight-forward." The answer, according to a new study, is that the cells do not start out as hexagons but as circles. Darwin in fact had suggested this but he had no supporting evidence. They gradually form into hexagons by a flow of the wax, which is turned semi-molten by the heat from specialist "heater" worker bees. At approx 45°C, the wax starts to flow slowly as an elastic liquid. The wax, softened by the heat, then gets pulled into hexagonal cells by surface tension at the junctions where three walls meet. Despite solving the mystery the researchers pay tribute to the bees, writing in the study: ""We cannot... ignore, nor can we not marvel at the role played by the bees in this process by heating, kneading and thinning the wax exactly where needed." And here I thought the combs were made by specialized hexagonal bees. During the construction of hexagonal cells, the wax temperature was between 33.6 and 37.6 °C. This is well below 40 °C, i.e. the temperature at which wax is assumed to exist in the liquid equilibrium that is essential for self-organised building. The mechanism for this transformation is the flow of molten visco-elastic wax near the triple junction between the neighbouring circular cells. The flow may be unconstrained or constrained by the unmolten wax away from the junction. Karihaloo explains that not all the bees act as 'heaters'. "The ambient temperature inside the comb is just 25 C"
So, rather than a contradiction, it seems more likely that the older study didn't measure the temperature at the loci accurately enough, relying more on overall ambient temperature. The "heater bees" seem to be applying more than enough heat to melt the wax at the junctions. The question is, how did you get that the "older study didn't measure the temperature at the loci accurately enough". Are you automatically assuming, that the new study is more reliable, than the older one? No, the older study says "the temperature of the wax" and the new study says "the temperature at the triple junction". It's stated that the new study focused on the loci, and the older study didn't address spot temperatures at all, only saying "the wax" as a whole. Thus, it's reasonable to conclude that because the older study didn't mention loci, and the newer study did, the newer study is likely to be more reliable in answering questions about focused heat points. In other words, it's not a question of reliability. It's about the newer study having data that the older study simply didn't. I'm sure they're both reliable enough within their scopes.